A new glogger community has been developed: it allows cyborgs across the world (using cameraphones) to continuously upload and share their stories, live and online. What's on at the Dana Centre: Last month, the Dana Centre in the UK hosted a "Creative Cyborgs" event examining the role of technology in modern life: "How have computers become an increasingly significant part of our imaginative and physical being? Come face-to-face with natural born cyborgs as we explore how computer technology impacts on us and our creativity. " You can't come face to face with the organizers, but you can listen to the podcast. 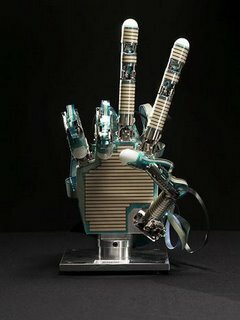 "A robotic hand controlled by the power of thought alone has been demonstrated by researchers in Japan. The robotic hand mimics the movements of a person's real hand, based on real-time functional magnetic resonance imaging (fMRI) of their brain activity. It marks another landmark in the advance towards prosthetics and computers that can be operating by thought alone. The system was developed by Yukiyasu Kamitani and colleagues from the ATR Computational Neuroscience Laboratories in Kyoto, and researchers from the Honda Research Institute in Saitama. Subjects lay inside an MRI scanner and were asked to make 'rock, paper, scissor' shapes with their right hand. As they did this, the MRI scanner recorded brain activity during the formation of each shape and fed this data to a connected computer. After a short training period, the computer was able to recognise the brain activity associated with each shape and command the robotic appendage do the same." The process in creating these pieces includes mammalian tissue culturing as well as computer generated form on which the cells are cultured and then transplanted into adaptive jewelry. The jewelry is worn on the body, completing the relationship of biological cells mediated by technology.epiSkin jewelry extends our biological identity by combining technology and design into a new decorative body surface. 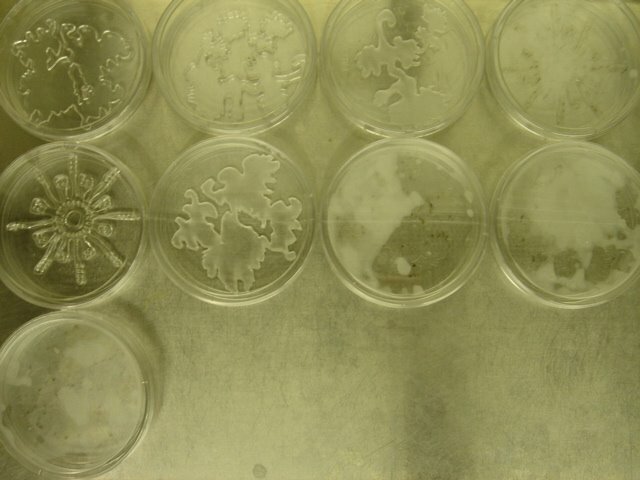 This project is an exploration into the decorative technological control over biology, to create an artifact which is a hybrid of both.